Pursuant to the authority conferred by Section 414 of the Municipalities Act, 1999, Chapter M-24, the Town of Grand falls-Windsor has made the following Animal Control Regulations. 1.​These Regulations shall be known and cited as the Town of Grand Falls-Windsor Animal Control Regulations. ​(a)​”Act” means the Municipalities Act, 1999 cM24. ​(b)​”Animal” means any animal, not excluding cat or dog. (c)​”Animal Pound” means a facility operated by or on behalf of the Town for the keeping and disposition of animals. (d)​”Cat” means a member of any breed of domesticated feline or crossbreed of domesticated feline whether spayed or neutered. (e)​”Council” means the Town Council of the Town of Grand Falls-Windsor. (f)​”Dog” means a male or female dog or pup and includes an animal which is a crossbreed between a dog and a wolf. (g)​”Municipal Enforcement Officer” means a peace officer with powers granted under Section 179 of the Act. (h)​”Impounder” means a person authorized by the council to impound any animal which is without an owner is not in the company of an owner, or any animal of which the owner has violated any provisions of these regulations. (i)​”Injured” and “Injury” include, but are not limited to, injuries caused by wounding, worrying, or pursuing. (j)​”Kennel” means an establishment for the keeping, breeding or boarding of dogs. (k)​”Live Trap” means a cage like device, approved by the S.P.C.A., used in the capture of cats, without injury to the animal. (l)​”Owner” means a person who owns harbors, has custody or has possession of an animal or a person who has charge of a house or premises or part of a premise where an animal is kept or permitted to live or remain. (m)​”Premises” means any property within the town. (n)​”Town” means the Town of Grand Falls-Windsor. (o)​”Town Clerk” means the Town Clerk of the Town of Grand Falls-Windsor. (ii)​on premises not owned by or in the possession of the owner of the animal. 3.​No person being an owner shall keep an animal within the Town limits unless a license has been issued by Council for such animal and unless such animal bears a numbered tag or plate indicating that such licence is valid. 4.​(a)​Every licence issued by Council shall have no expiry date and shall be non-transferable. ​(i)​$10.00​- for a neutered or spayed dog. ​(ii)​$30.00 – for an unneutered or an unspayed dog. ​(iii)​$10.00 – for a neutered or spayed cat. 5.​No person shall breed animals unless a licence has been issued by Council. This license must be renewed each time the animal is bred. 6.​No person shall operate a kennel or carry on any business or institution for boarding, keeping, training or treating animals unless permission for such operation is granted by Council. 7.​If an animal while not in the company of its owner, or a member of its owners household, is found in any public place or any private property without the consent of the property owner, occupant or person having control of such property, the owner of such animal, as well as the person who caused the animal to be in such a place, shall be deemed to have committed an offence in terms of these Regulations. 8.​Any animal found at large in the Town contrary to these Regulations, may be humanely destroyed by the impounder at the expiration of two days after the time of impounding. 9.​If any animal shall bark or howl in such a manner as to disturb the peace, or to constitute an annoyance to residents in the neighbourhood, such animal shall be deemed to be a nuisance and the owner thereof shall be deemed to have committed an offence in terms of these Regulations. 10.​(a)​If any animal shall cause damage to any lawn, grass plot, garden or flower bed, or flower, shrub or plant or if an animal causes garbage placed for collection to be disturbed, such animal shall be deemed to be a nuisance and the owner thereof shall be deemed to have committed an offence in terms of these Regulations. on private property, may be seized by the affected property owner and held for collection by the impounder. 11.​If an animal shall bite any person other than its owner, or a member of its owner’s household and while not in the owner’s premises, such animal shall be deemed to be a nuisance and the owner thereof shall be deemed to have committed an offence in terms of these Regulations. 12.​Any court of summary jurisdiction may take cognizance of a complaint that an animal is dangerous and not kept under proper control or has bitten or attempted to bite any person and if it appears to the court that the animal is dangerous or has done any of the things referred to herein, the court may order the owner of the animal to destroy it. 13.​Any person authorized to destroy an animal under these Regulations may destroy it or may complain to a Provincial Court Judge, who, upon verification of the authorization, may make an order directing the owner of the animal to destroy it. 14.​The owner of an animal who fails to comply with an order made under regulation 12 or regulation 13 shall be deemed to have committed an offence in terms of these Regulations. 15.​Whenever an animal is found, in any public place or on any private property without the consent of the property owner, occupant or person having control of such private property, or without a tag or plate as required by regulation 3 or is not accompanied as required by regulation 6 or is not held securely on a leash by a person capable of restraining its movements or is not confined to private property, the impounder shall and any person may cause the dog to be impounded. 16.​(a)​No person shall keep an animal in the Town, unless the animal is safely tethered or penned up at all times or kept securely on a leash by a person capable of restraining its movements. ​(b)​An animal which is tethered or penned up pursuant to these regulations shall be tethered or penned up in a manner which may not be regarded as imposing undue hardship or cruelty to the animal. ​(c)​When an animal which does not bear a numbered tag or plate, as required by these regulations, has been impounded, the impounder shall cause the animal to be disposed of or humanely destroyed at the expiration of forty-eight (48) hours after the time of impounding. ​(e)​Upon payment of the impounding fee and of the licence fee described where an animal is not licenced, the impounder may release any animal which fails to be disposed of or destroyed, to any person requesting such animal and the ownership of such animal shall then vest in the person to whom it is released and the former owner shall have no right or claim to such animal. (f)​When an animal for which Council refuses to issue a licence or permit to be kept within the Town, is found to be kept within the Town, the owner of such animal is deemed to have committed an offence and the impounder shall impound the animal. (g)​If an animal for which the Council refuses to issue a licence or permit to be kept in the Town is found at large, it shall be the duty of the impounder to seize and impound such animal and to enter any premises for the purpose of recapturing such animal which may escape from his control. 18.​The following fees shall be paid by the owners of animals seized or impounded because Council refused to issue a licence or permit to be kept within the town. (c)​plus all actual expenses for necessary food and veterinarian treatment for the animal. 19.​No person except a Council employee may enter an impounding area without permission from Council. 20.​Any person found to tease an animal caught in a trap or throwing or poking any object into the trap when an animal is caught therein, is guilty of an offence and upon conviction shall be liable for a fine of $1,000.00. 21.​Any person who removes an animal from an impound without having first paid the fees required by these regulations commits an offence. 22.​(a)​Any person who interferes with or attempts to interfere with a Municipal Enforcement officer of Animal Control officer or S.P.C.A. representative in the exercise of their duties, shall be deemed to have committed an offence in terms of these regulations. ​(b)​Any person who, without authority of a Municipal Enforcement officer or Animal Control officer of S.P.C.A. representative, releases any animal which has been impounded, shall be deemed to have committed an offence in terms of these regulations. ​(c)​Every person requested by a Municipal Enforcement officer or Animal Control officer or S.P.C.A. representative, shall forthwith give his or her proper name and address. (b) for a subsequent offence to a fine of not less than $500 and not more than $1,000 or to a term of imprisonment of not more than 3 months or to both the fine and imprisonment. Officer, including a Municipal Enforcement Officer. Help you pet stay safe. As a reminder please check your local municipal guidelines regarding keeping a pet(s). 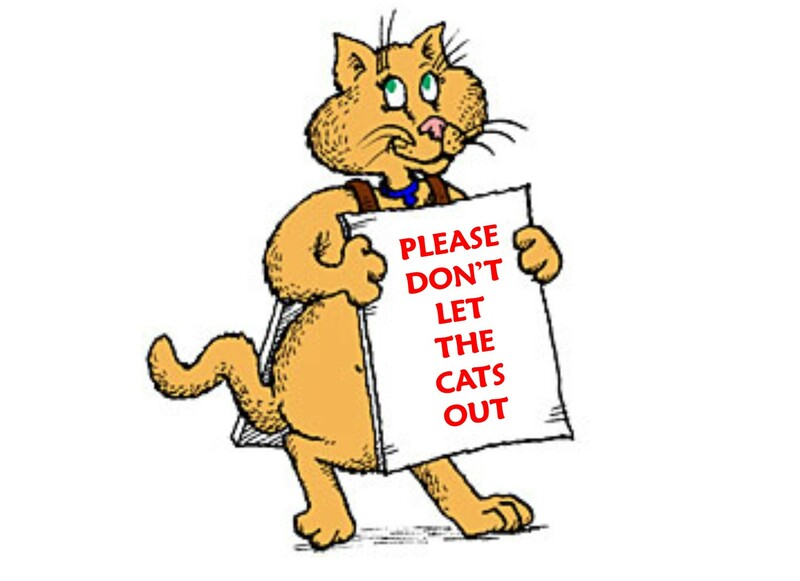 In many communities in Newfoundland and Labrador it is against the law to let your pets roam freely (including cats). Cats are always safer inside!!! Before heading to the store to get any product to use on your pet, please check with your vet first.